The Largo Police Department has canceled the Silver Alert for Linda Jean Farrell-Conley. She was located in Webster County, Georgia in good health. Her family will be en route to that location to be reunited with her. The Largo Police Department has issued a Silver Alert for 56 year-old Linda Conley. Conley was last seen operating a Blue 2009 Toyota Camry, tag#173QCY on the evening of 10/23/17 in the area of southbound I-275 at the Ulmerton Rd exit. She suffers from cognitive impairment and is likely lost. Her cell phone battery is dead. She is 5’0, 120#, Brown hair and has Brown eyes. 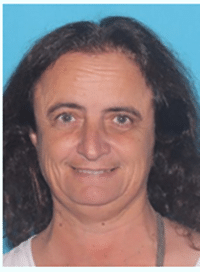 Any contact with Linda or the vehicle, please contact local law enforcement or Detective Keith Wedin of the Largo Police Department at (727)587-6730.